Sometimes it's hard to think of the best gift for our loved ones. Not sure enough if the person will like the present so why not give him/her the freedom to choose? Acer Philippines together with The SM Store recently launched with its endorsers JM De Guzman and Jennylyn Mercado its #MalayangPasko Holiday Promo. 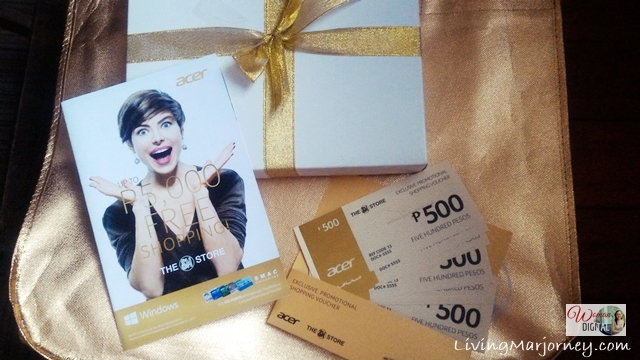 Dubbed #MalayangPasko, Acer partners with the The SM Store to provide a wonderful shopping experience for its customers. The brand believes that it's best to give consumers the freedom to choose their gift. 1. Acer's Holiday Promo will run until December 31, during which every purchase of qualifying Windows-based Acer Aspire laptops, desktops, and AllInOnes will come with free The SM Store Exclusive Promotional Shopping Voucher. 2. Customers will get shopping vouchers worth P5,000 for every purchase of Intel Core i7-powered laptops and desktops; P3,000 for Intel Core i5-powered laptops and desktops; and 1,000 for Intel Core i3-powered laptops, desktops and projectors. 3. Additionally, exclusive rewards await SM Advantage holders. Customers who present their SM Advantage Card, SM Prestige Cards, BDO Rewards Card can enjoy 10x more SMAC points whenever they redeem using their Exclusive Promotional Voucher in the SM Store. Want more? Simply visit Acer Philippines Facebook Page or at Acer Philippines website at www.acer.com.ph. I love to shop especially if there are exclusive rewards from the shop or after credit card spending. Do you have holiday shopping tips?